The Black Death had killed an estimated one-third of the population of France from its appearance in 1348. The concurrent Hundred Years' War slowed recovery. It would be the early 16th century before the population recovered to mid-14th-century levels. Linguistically, the differences in France were extreme. 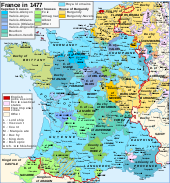 Before the Renaissance, the language spoken in the north of France was a collection of different dialects called Oïl languages whereas the written and administrative language remained Latin. 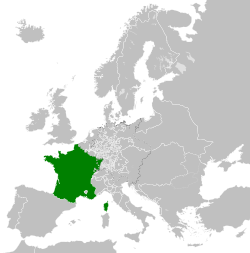 By the 16th century, there had developed a standardised form of French (called Middle French) which would be the basis of the standardised "modern" French of the 17th and 18th century which in turn became the lingua franca of the European continent. (In 1539, with the Ordinance of Villers-Cotterêts, Francis I of France made French alone the language for legal and juridical acts.) Nevertheless, in 1790, only half of the population spoke or understood standard French. After the Hundred Years' War (1337–1453) and the Treaty of Picquigny (1475)—its official end date—in 1492 and 1493, Charles VIII of France signed three additional treaties with Henry VII of England, Maximilian I of Habsburg, and Ferdinand II of Aragon respectively at Étaples (1492), Senlis (1493) and in Barcelona (1493). 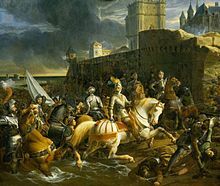 As the 15th century drew to a close, French kings could take confidence in the fact that England had been mostly driven from their territory and so they could now embark on an expansionist foreign policy. The invasion of Italy by Charles VIII in 1494 began 62 years of war with the Habsburgs (the Italian Wars). 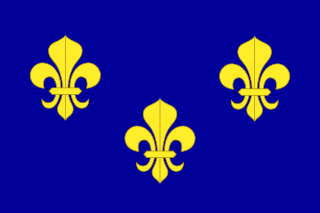 Ludovico Sforza, the Duke of Milan, seeking an ally against the Republic of Venice, encouraged Charles VIII of France to invade Italy, using the Angevin claim to the throne of Naples, then under Aragonese control, as a pretext. When Ferdinand I of Naples died in 1494, Charles invaded the peninsula. For several months, French forces moved through Italy virtually unopposed, since the condottieri armies of the Italian city-states were unable to resist them. Their sack of Naples finally provoked a reaction, however, and the League of Venice was formed against them. Italian troops defeated the French at the Battle of Fornovo, forcing Charles to withdraw to France. Ludovico, having betrayed the French at Fornovo, retained his throne until 1499, when Charles's successor, Louis XII of France, invaded Lombardy and seized Milan. 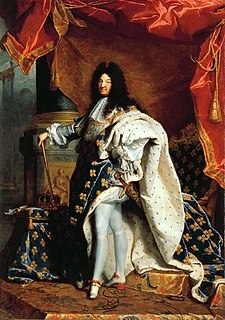 For most of the reign of Louis XIV (1643–1715), France was the dominant power in Europe, aided by the diplomacy of Richelieu's successor (1642–1661) Cardinal Mazarin and the economic policies (1661–1683) of Colbert. Colbert's attempts to promote economic growth and the creation of new industries were not a great success, and France did not undergo any sort of industrial revolution during Louis XIV's reign. Indeed, much of the French countryside during this period remained poor and overpopulated. The resistance of peasants to adopt the potato,according to some monarchist apologists, and other new agricultural innovations while continuing to rely on cereal crops led to repeated catastrophic famines long after they had ceased in the rest of Western Europe. Prior to Louis XIV's reign, French soldiers frequently went into battle barefoot and with no weapons. On the other hand, France's high birthrate until the 18th century proved beneficial to its rulers since it meant the country could field larger armies than its neighbors. In fact, the king's foreign policy, as well as his lavish court and construction projects, left the country in enormous debt. The Palace of Versailles was criticized as overly extravagant even while it was still under construction, but dozens of imitations were built across Europe. 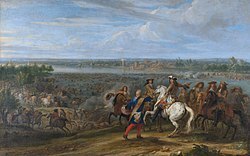 Renewed war (the War of Devolution 1667–1668 and the Franco-Dutch War 1672–1678) brought further territorial gains (Artois and western Flanders and the free county of Burgundy, left to the Empire in 1482), but at the cost of the increasingly concerted opposition of rival powers. Following the Whig establishment on the English and Scottish thrones by the Dutch prince William of Orange in 1688, the anti-French "Grand Alliance" of 1689 was established. With the Turks now in retreat, the emperor Leopold could turn his attention to France. The ensuing War of the Grand Alliance lasted from 1688–1697. France's resources were stretched to the breaking point by the cost of fielding an army of over 300,000 men and two naval squadrons. Famine in 1692–1693 killed up to two million people. The exhaustion of the powers brought the fighting to an end in 1697, by which time the French were in control of the Spanish Netherlands and Catalonia. However, Louis gave back his conquests and gained only Haiti. The French people, feeling that their sacrifices in the war had been for nothing, never forgave him. In November 1700, the severely ill Spanish king Charles II died, ending the Habsburg line in that country. Louis had long waited for this moment, and now planned to put a Bourbon relative, Philip, Duke of Anjou, on the throne. 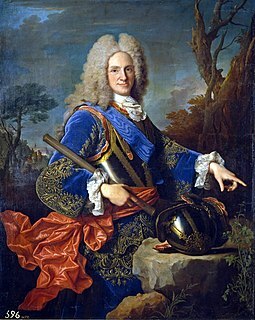 Essentially, Spain was to become an obedient satellite of France, ruled by a king who would carry out orders from Versailles. Realizing how this would upset the balance of power, the other European rulers were outraged. However, most of the alternatives were equally undesirable. For example, putting another Habsburg on the throne would end up recreating the empire of Charles V, which would also grossly upset the power balance. After nine years of exhausting war, the last thing Louis wanted was another conflict. However, the rest of Europe would not stand for his ambitions in Spain, and so the War of the Spanish Succession began, a mere three years after the War of the Grand Alliance. While often considered a tyrant and a warmonger (especially in England), Louis XIV was not in any way a despot in the 20th-century sense. The traditional customs and institutions of France limited his power and in any case, communications were poor and no national police force existed. Overall, the discontent and revolts of 16th- and 17th-century France did not approach the conditions that led to 1789. Events such as the Frondes were a naïve, unrevolutionary discontent and the people did not challenge the right of the king to govern nor did they question the Church. 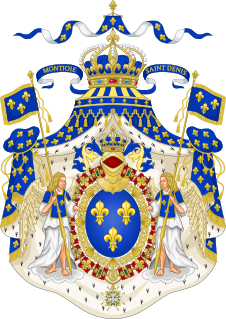 The reign (1715–1774) of Louis XV saw an initial return to peace and prosperity under the regency (1715–1723) of Philip II, Duke of Orléans, whose policies were largely continued (1726–1743) by Cardinal Fleury, prime minister in all but name. The exhaustion of Europe after two major wars resulted in a long period of peace, only interrupted by minor conflicts like the War of the Polish Succession from 1733–1735. Large-scale warfare resumed with the War of the Austrian Succession (1740–1748). But alliance with the traditional Habsburg enemy (the "Diplomatic Revolution" of 1756) against the rising power of Britain and Prussia led to costly failure in the Seven Years' War (1756–1763) and the loss of France's North American colonies. Anti-establishment ideas fermented in 18th-century France in part due to the country's relative egalitarianism. While less liberal than England during the same period, the French monarchy never approached the absolutism of the eastern rulers in Vienna, Berlin, St. Petersburg, and Constantinople in part because the country's traditional development as a decentralized, feudal society acted as a restraint on the power of the king. Different social classes in France each had their own unique set of privileges so that no one class could completely dominate the others. Upon Louis XV's death, his grandson Louis XVI became king. Initially popular, he too came to be widely detested by the 1780s. Again a weak ruler, he was married to an Austrian archduchess, Marie Antoinette, whose naïvety and cloistered/alienated Versailles life permitted ignorance of the true extravagance and wasteful use of borrowed money (Marie Antoinette was significantly more frugal than her predecessors). French intervention in the US War of Independence was also very expensive. France in the Ancien Régime covered a territory of around 200,000 square miles (520,000 km2), and supported 22 million people in 1700. At least 96% of the population were peasants. France had the largest population in Europe, with European Russia second at 20 million. Britain had nearly six million, Spain had eight million, and the Austrian Habsburgs had around eight million. France's lead slowly faded after 1700, as other countries grew faster. Very few women held any power—some queens did, as did the heads of Catholic convents. In the Enlightenment, the writings of philosopher Jean-Jacques Rousseau gave a political program for reform of the Ancien Régime, founded on a reform of domestic mores. Rousseau's conception of the relations between private and public spheres is more unified than that found in modern sociology. Rousseau argued that the domestic role of women is a structural precondition for a "modern" society. Within early modern society, women of urban artisanal classes participated in a range of public activities and also shared work settings with men (even though they were generally disadvantaged in terms of tasks, wages and access to property.) Salic law prohibited women from rule; however, the laws for the case of a regency, when the king was too young to govern by himself, brought the queen into the center of power. The queen could assure the passage of power from one king to another—from her late husband to her young son—while simultaneously assuring the continuity of the dynasty. Educational aspirations were on the rise and were becoming increasingly institutionalized in order to supply the church and state with the functionaries to serve as their future administrators. Girls were schooled too, but not to assume political responsibility. Girls were ineligible for leadership positions and were generally considered to have an inferior intellect to their brothers. France had many small local schools where working-class children—both boys and girls—learned to read, the better "to know, love and serve God". The sons and daughters of the noble and bourgeois elites, however, were given quite distinct educations: boys were sent to upper school, perhaps a university, while their sisters (if they were lucky enough to leave the house) were sent for finishing at a convent. The Enlightenment challenged this model, but no real alternative presented itself for female education. Only through education at home were knowledgeable women formed, usually to the sole end of dazzling their salons. ^ Bély, 21. In 1492, roughly 450,000 km2 (173,746 sq mi) versus 550,000 km2 (212,356 sq mi) today. ^ René Pillorget and Suzanne Pillorget, France baroque, France classique: 1589–1715 (1996) pp. 1155–57. ^ Antonio Santosuosso, "Anatomy of Defeat in Renaissance Italy: The Battle of Fornovo in 1495," International History Review (1994) 16#2 pp. 221–50. ^ W. R. Ward, Christianity under the Ancien Régime, 1648–1789 (1999). ^ Landes, Joan B. Women and the Public Sphere in the Age of the French Revolution. Cornell University Press, 1988. Ward, W.R. Christianity under the Ancien Régime, 1648–1789 (1999). The 17th century was the century that lasted from January 1, 1601, to December 31, 1700, in the Gregorian calendar. 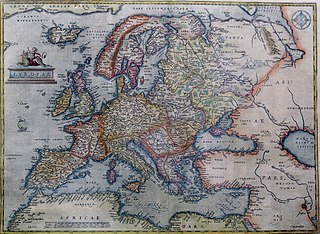 It falls into the Early Modern period of Europe and in that continent was characterized by the Baroque cultural movement, the latter part of the Spanish Golden Age, the Dutch Golden Age, the French Grand Siècle dominated by Louis XIV, the Scientific Revolution, and according to some historians, the General Crisis. The greatest military conflicts were the Thirty Years' War, the Great Turkish War, and the Dutch-Portuguese War. It was during this period also that European colonization of the Americas began in earnest, including the exploitation of the silver deposits, which resulted in bouts of inflation as wealth was drawn into Europe. From 1416 to 1860, the Duchy of Savoy was a state in Western Europe. It was created when Sigismund, King of the Romans, raised the County of Savoy into a duchy for Amadeus VIII. The duchy was a subject of the Holy Roman Empire with a vote in the Imperial Diet. From the 16th century, Savoy belonged to the Upper Rhenish Circle. Throughout its history, it was ruled by the House of Savoy and formed a part of the larger Savoyard state. 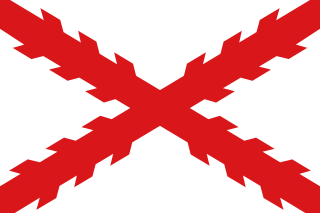 The Franco-Spanish War (1635–1659) was a military conflict that was the result of French involvement in the Thirty Years' War. After the German allies of Sweden were forced to seek terms with the Holy Roman Empire, the French first minister, Cardinal Richelieu, declared war on Spain because French territory was surrounded by Habsburg territories. The conflict was a continuation of the aims of the War of the Mantuan Succession (1628–31) in which France invaded northern Italy to take possession of territory claimed by the Spanish Habsburgs. Though some minor territorial gains were made by France, the Franco-Spanish War ended inconclusively in 1659 with the Treaty of the Pyrenees. International relations from 1648–1814 covers the major interactions of the nations of Europe, as well as the other continents, with emphasis on diplomacy, warfare, migration, and cultural interactions, from the Peace of Westphalia to the Congress of Vienna. It is followed by International relations of the Great Powers (1814–1919).